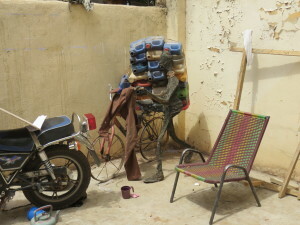 Contemporary art in Bamako, Mali. Rosalie van Deursen travelled to Bamako to talk with local artists about contemporary art in Mali. Throughout the month of June this year, Bamako, the capital of Mali, was relocated to Dakar in Senegal. At the ‘Walk through Bamako. 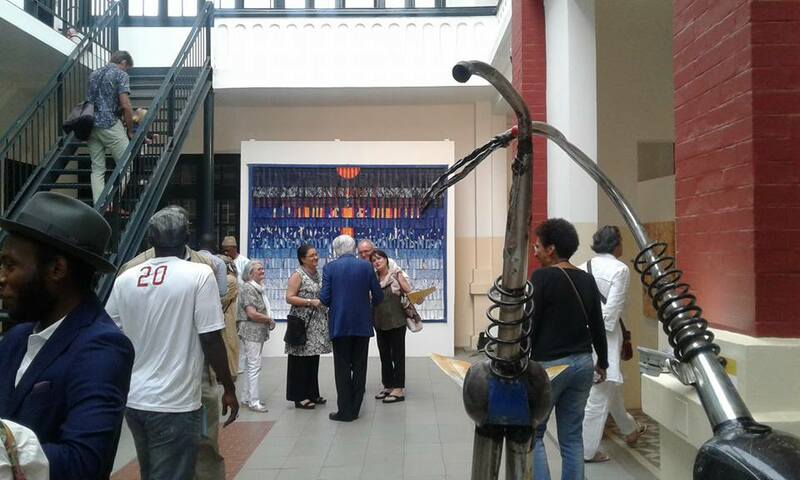 Arts spaces and artists in the city’ exhibition visitors were invited to take a stroll through the Malian city. This exhibition was part of the 12th edition of Dak’Art 2016, the contemporary African art biennale. Vernissage ‘Walk through Bamako’, 2016. After the biennale in Dakar I flew back to Bamako itself. This time I visited the ‘Badialan 1’ and ‘Anw-Ko Art’ art spaces. The latter means: together we make art in Malian Bambara. 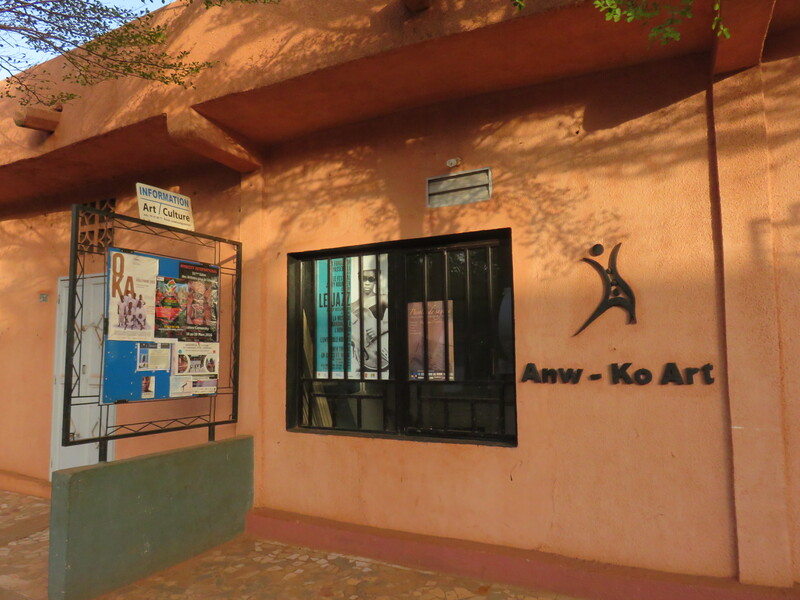 The ‘Anw-Ko Art’ artists’ association initiated by Souleymane Ouologuem consists of a space that serves as a depot for artworks, a work studio, exhibition space and simultaneously a place for meetings and workshops. Ouologuem creates elongated vertical paintings divided into different colour fields. He works with mixed media, acrylic paints, pigments, pastels, charcoal and collages. The colour fields are divided by lines, which often consist of smaller colour cubes or patches. Paint layers are thicker in some places and are spread very evenly and in an orderly fashion on the canvas. This abstract character creates an impression of tranquillity, rhythm and space. This high degree of abstraction originates from Ouologuem’s desire to return to the basics. He refers to his work as ‘Foundations’ and explains: “Everything has a source that should be good and solid, otherwise it’s all meaningless, no matter how beautiful the outside is. 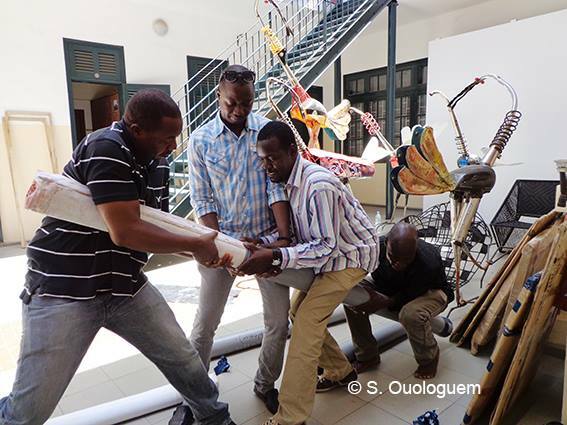 This applies to both people and buildings.” Ouologuem hopes to create awareness. He sighs: “All over the world people are losing their culture and values, such as respect for their elders. It is evident in loose parenting and I see children being raised without rules. The basis is gone.” In Ouologuem’s ethnic background, Dogon, there have always been solid family structures that ensure individuals a strong foundation. This structure is reflected in the architecture of the Dogon family houses, which are a source of inspiration for him. During my visit to Bamako, I visited ‘Badialan 1’ twice. This art space is named after the neighbourhood in which it is located and is always a busy venue with a constant coming and going of artists and visitors. The house is divided into multiple rooms providing workspace for a large number of artists. Although no one seems to have a permanent workplace in this collective founded by Amadou Sanogo and Ibrahim Konaté. Sanogo explains how the space came about: “We needed a place where we could operate freely and conduct research without family or neighbours watching over our shoulders. In addition, we wanted to invite other artists to discuss issues and organize debates. It is a gathering of visual artists, musicians, writers and curators. We started together and the initiative grew into ‘Badialan 1’ in its current setting. Fortunately we are now part of the international art scene.” Artists working at ‘Badialan 1’ are: Noumouké Camara, Toussaint Klémagha Dembélé, Mohammed Diabagate, Karim, Oumar Kouma, Ibrahima Konaté, Amidou Koumare, Amadou Sanogo, Siaka Togola (who is also known as ‘Zulu’) and Massira Touré. Artist at work in Badilan Art Space. 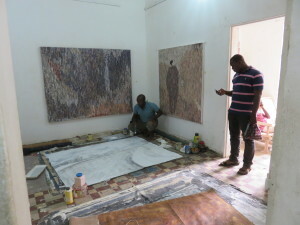 Artwork of Toussaint Klémagha Dembélé at Art Space Badialan. 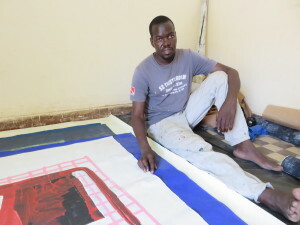 Massira Touré at Art Space Badialan. Sanogo makes no bones about the fact that Mali needs him. Why? Sanogo wants to break taboos and arouse people’s curiosity and invite them to question the world around them. He makes big brightly coloured canvases with strongly aligned figures. 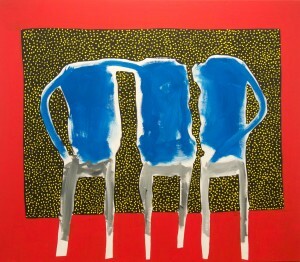 These highly abstracted figures are often stretched and appear distorted. Heads are not located on the trunk, limbs merge or feet crush a head. The faces raise questions; why do they look tormented, strange and scared? What stories are being told here? Why are there so many dots? Daily life is Sanogo’s inspiration. He explains: “There are so many things that inspire me in my interactions with people but also in my observations. When I read the newspaper, watch TV or use Facebook I question the world around me. I wonder ‘in what plan?’ or ‘on what basis?’ or ‘compared to what?’ or ‘what is the context?” Curiosity and investigation are what drive Sanogo’s art. Amadou Sanogo talks about his work. What is the value of art in a country where people are looking for food? Sanogo asks himself the question and answers firmly: “Food does not only pass through the mouth, the intellect also needs to be fed. It needs to digest observations. Only when you understand that every reality as shown on TV or in a newspaper is directed, then you are free. I also hope that more people look at themselves instead of blaming others. Criticizing others is easy; think how we criticise a president. But what if you were sitting on the president’s chair? 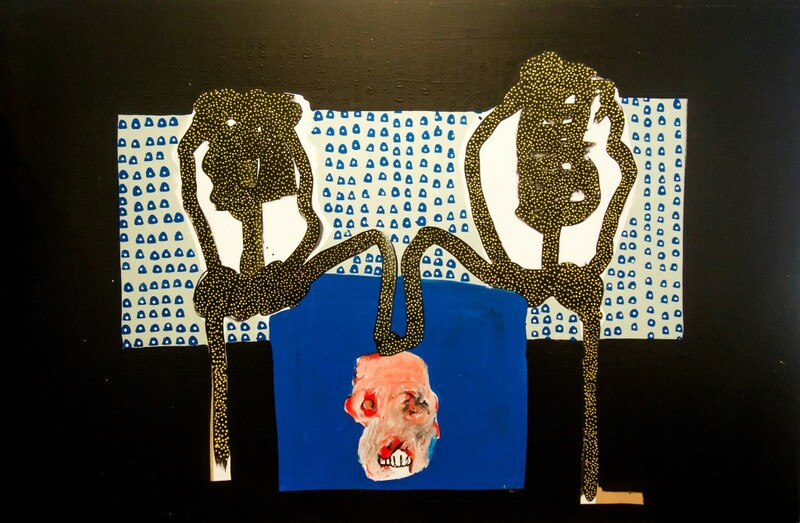 What would you do?” Sanogo has incorporated this theme in a work in which a crowned figure sits on a dotted carpet. 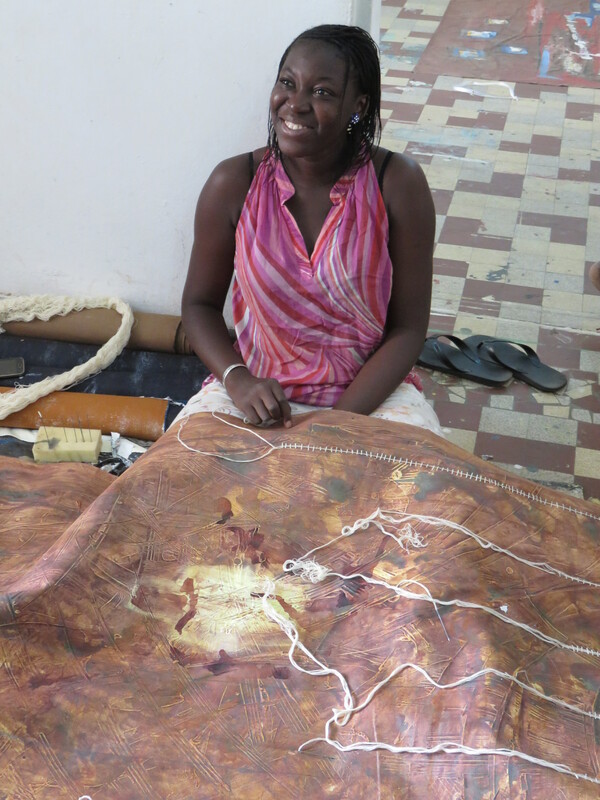 Bamako’s art scene is buzzing as never before. Determined artists are uniting and conquering both the national and international art scene.